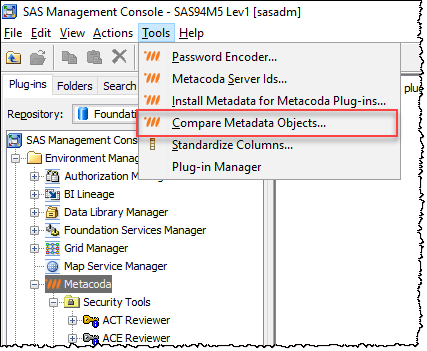 It is usually obvious where a SAS user’s metadata home folder (My Folder or private user folder) is – just look under /User Folders/ (or /Users/ in older SAS versions) for a folder with the user’s name. Sometimes, however, it can be a little trickier to locate: the user name may be cryptic or the user may have been added and deleted in metadata multiple times and you have folders with numeric suffixes i.e. name, name(1), name(2) etc. To be confident, a user’s home folder can be found specified in metadata. As highlighted in the screenshot below, using the Metacoda User Reviewer, select the user, right click and select Advanced Properties from the context menu. 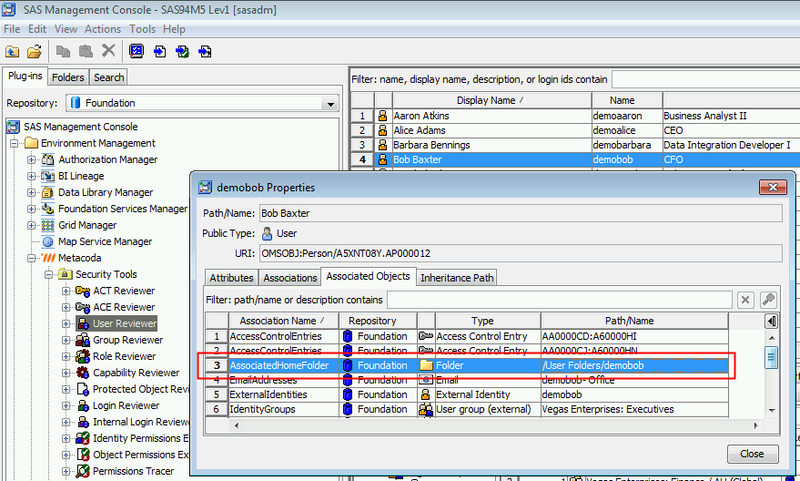 In the Advanced Properties dialog, and the Associated Objects tab you should see the home folder listed in the row where the Association Name is AssociatedHomeFolder.